You are here: Home / Uncategorized / Bakery Love – what is your favorite bakery? Bakery Love – what is your favorite bakery? Bakery Love – what is your favorite bakery?, originally uploaded by IheartPGH. I had cupcakes on my mind yesterday morning, I was looking for some snacks to take to a meeting, I was thinking about how much I liked the Waldorf bakery that used to be on Murray ave in Sq. Hill (it is now a Panera). I ended up making a stop at Prantl’s bakery on Walnut St. In shady side. Prantl’s is well known for their burnt almond torte. I also think that they have quite an amazing selection of treats. 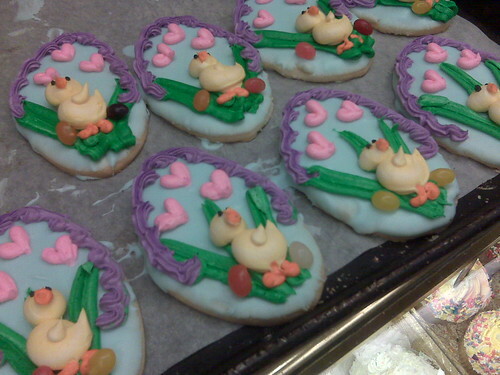 I just thought these easter cookies were so pretty – they were kind enough to let me snap a picture before they put them into the bakery case. What is your favorite bakery in Pittsburgh?